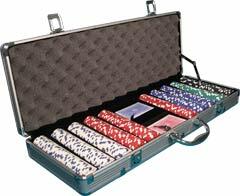 Choose from our wide selection of Chip Sets, including five different "Complete Poker Sets." 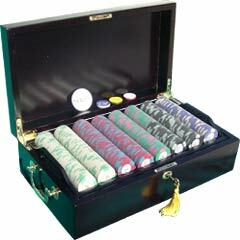 Each set is fully equipped for play, with a Carry Case, Chips, Playing Cards, and Poker Buttons. 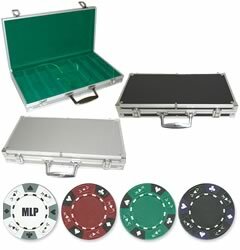 We also carry World Poker Tour (WPT), and Kem Poker Chip Sets, featuring polished Aluminum Cases and Heavyweight Chips. Monogrammed Poker Chips Sets that are custom imprinted with any initials you choose on the chips are also available! These Custom Monogrammed Poker Chip Sets feature either 300 or 500 chips in each set. All our Custom Imprinted Monogrammed Poker Chip Sets ship about two to three weeks after you place your order.